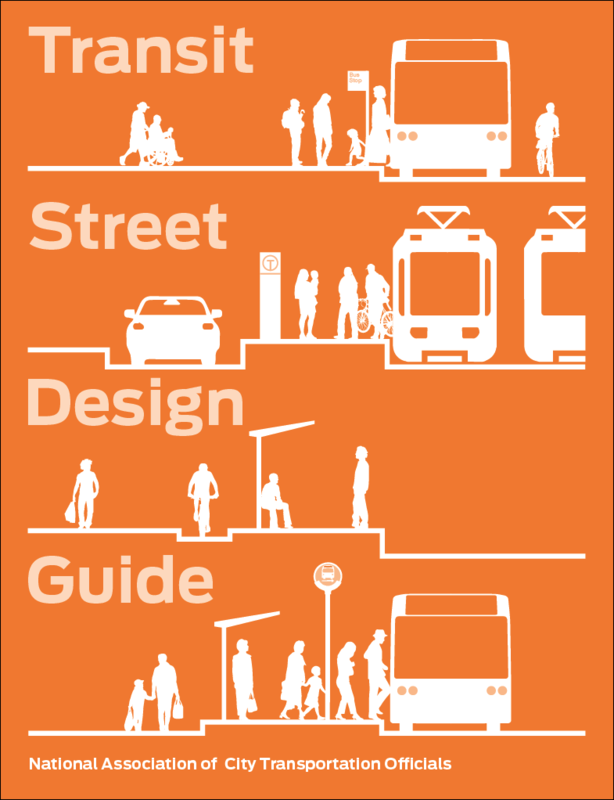 Small one-way streets operate in couplets in downtown or neighborhood main street contexts, often with short blocks, dense destinations, low traffic speeds, rich pedestrian activity, and frequent boarding activity. 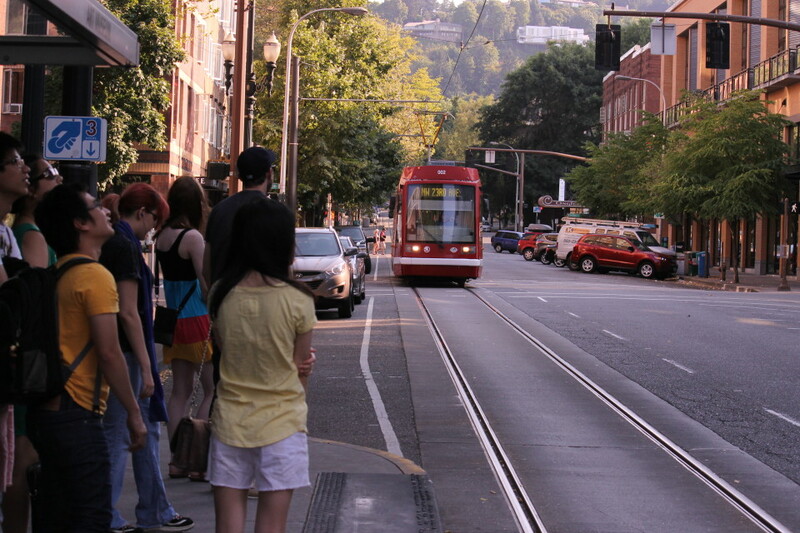 Streetcars enhance the sense of place, and often require retrofitted boarding platforms to provide basic accessibility. Transformations enhance the pedestrian realm and rider queuing area, as well as signal timing and coordination strategies. Motorists must be deterred from parking in, standing in, or otherwise blocking the streetcar lane. Use pavement patterns and markings, camera enforcement, and signage to deter obstructions. Transit service must be balanced with pedestrian volumes and movement. Curb extensions and streetscape enhancements benefit the pedestrian realm and create a pleasant experience walking to and waiting for transit. In downtown networks where most streets operate one-way, time signals throughout the network to fixed low-speed progressions, which benefit transit operations, bicycling, and walking. Portland utilizes a quarter-cycle offset signal timing pattern, which offsets signal timings throughout a relatively consistent downtown street grid. Signal progression is determined by block lengths, resulting in a low-speed progression of 12–16 mph that benefits bicyclists and transit riders. Simultaneously, the timing creates a “reverse progression” for pedestrians walking 4 mph. Traffic Signal Timing Manual. “Ch. 6: Coordination.” FHWA (2008). Boarding bulbs provide a comfortable waiting space, and eliminating the need to enter the street in order to board transit vehicles. Bulbs may need to be extended to meet the streetcar doors, and curb height and shape must be designed for compatibility with streetcar vehicles. Level or near-level boarding heights improve transit accessibility. On routes with significant bicycle traffic, streets should have separate bicycle lanes outside of the track zone. Alternatively, create high-quality parallel bicycle routes. 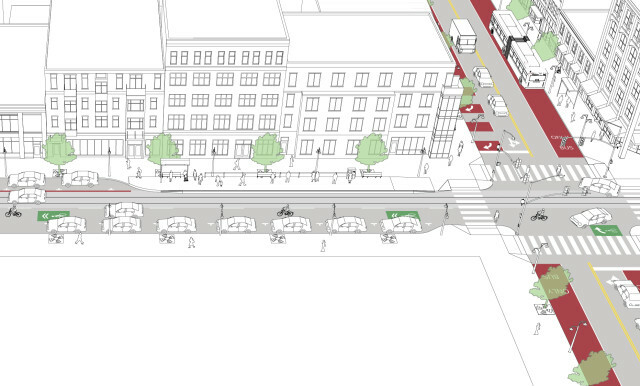 One-way street configuration can allow streetcars and bicyclists to operate on opposite sides of a street, reducing conflicts. If on the same side of the street, provide a sufficiently wide bikeway to avoid the risk of bicycle tires getting caught in flangeway gap or concrete seams. Where necessary, direct bicycle turns and movements to cross tracks as near to 90 degrees as possible. References for One-Way Streetcar Street: 1 found.